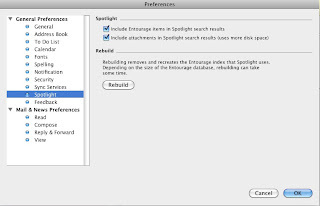 After a simple Upgrade to Snow Leopard I noticed that Microsoft Entourage no longer produces any results for new Searches or for existing Saved Searches. Thanks, your tip worked great! Thanks! You're a life saver, that tip totally worked.